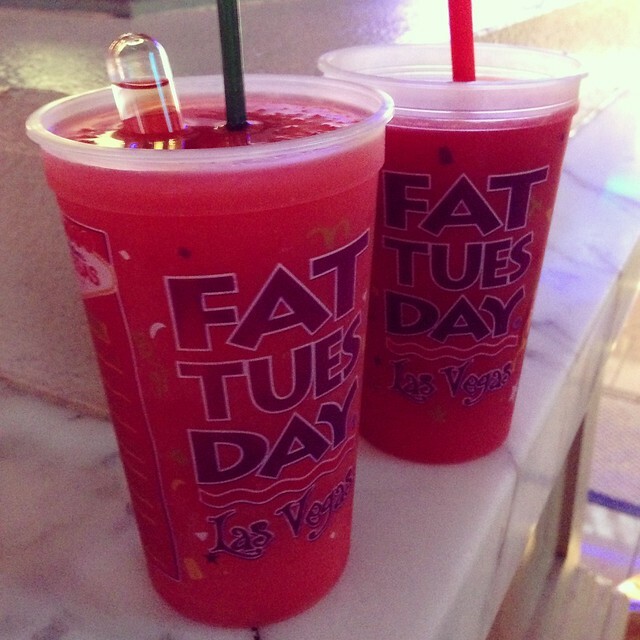 Vegas Eats [travel] – Cin Cin, Let's Eat! 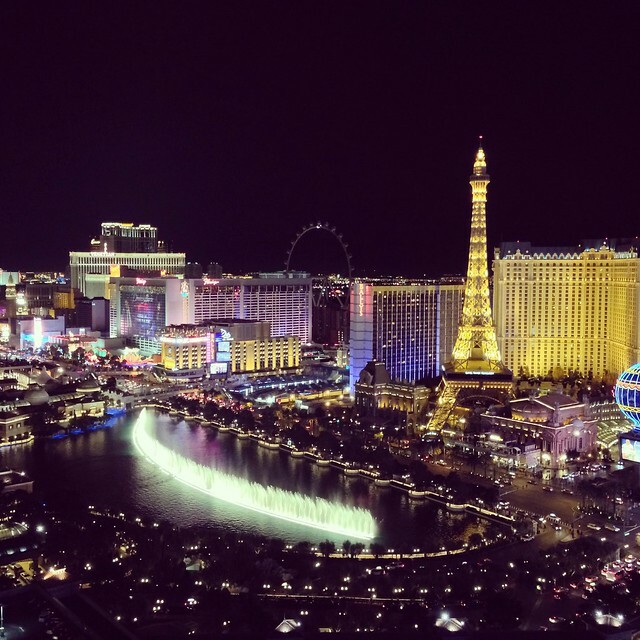 In December, we scored a great deal for a terrace suite with Bellagio fountain view at the Cosmopolitan. Hotels are very inexpensive right after Christmas and before NYE. Last week we visited right after the July 4th weekend, and were able to get a room for cheap at Planet Hollywood, even got an upgrade when we checked in. That’s a good tip to know – come right after a major holiday and you can score a really nice suite for very little money. We absolutely adored the Cosmopolitan, it’s so posh, trendy, and very comfortable. It’s centrally located on the strip, with so many great restaurant as well as one of the best clubs in Vegas right on site, and it’s home to my favorite lounge/bar – the Chandelier Bar. 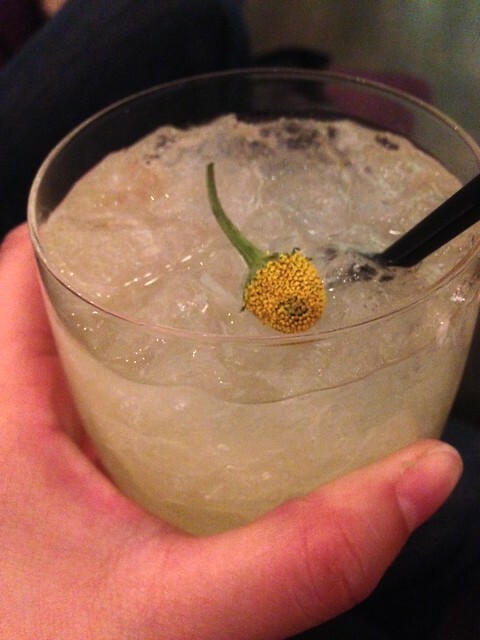 This next drink is called “The Summer of Love” and tastes like a fluffy meyer lemon cloud. 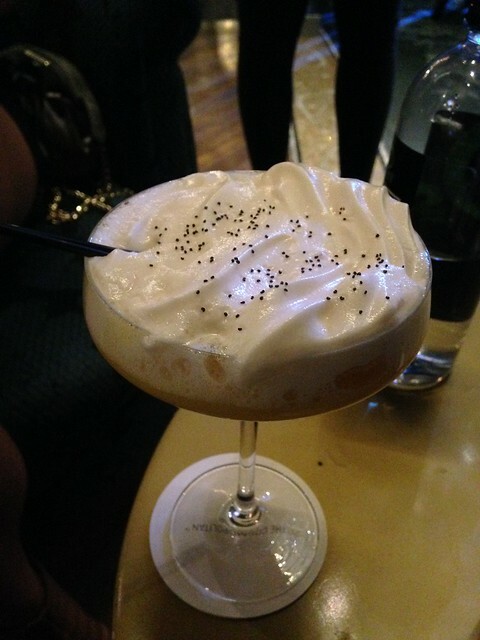 It’s made with meyer lemon vodka, yogurt liqueur, fresh lemon calamansi, poppy seed liqueuer, and topped with cream cheese frosting espuma. Doesn’t that sound decadent? 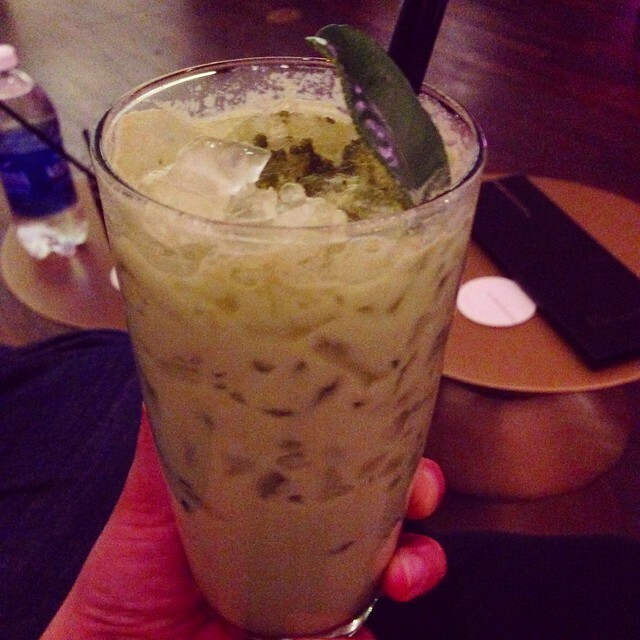 This drink is available on the top level of the bar. 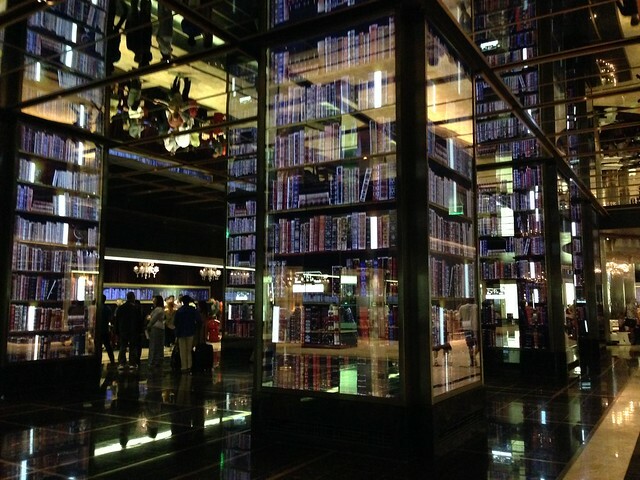 LOVED the lobby of the Cosmopolitan hotel. The display changes constantly from weird human shadows to aquariums, to rows and rows of bookshelves. 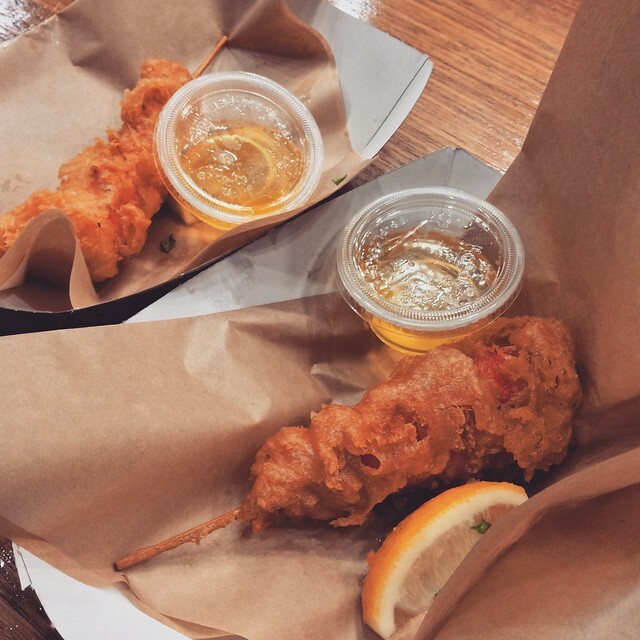 The Lobsicle – A battered whole lobster tail on a stick?! YES, YES, and YES! Such a decadent snack while shopping. If you don’t like fried food, grilled lobsicle is also an option. And lobster mac ‘n cheese, lobster grilled cheese…etc. This is definitely a tourist trap but hey, I had fun! It’s a two-story shop filled with Coca-Cola merchandises. 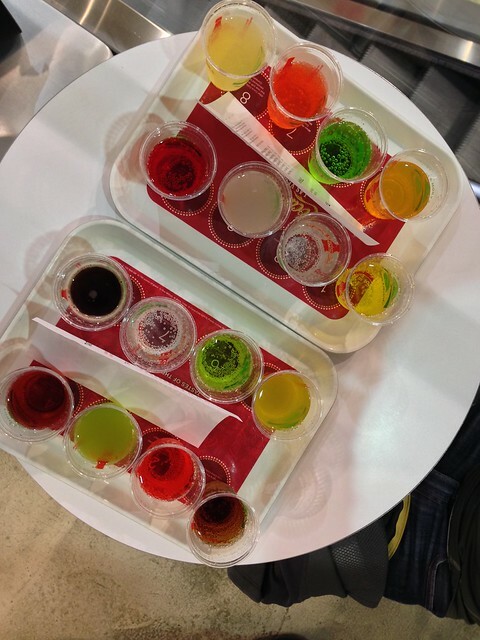 For less than $10, you can sample 16 different types of Coca-Cola products from around the world. There is also a “float” option if you are feeling extra indulgent, which comes with a scoop of ice cream with each soda. My obligatory stop when in Vegas. (Sometimes twice daily…) A whole wall full of different types of daiquiris and boozy slushies…decisions, decisions…Be sure to get the extra shots! Don’t bother getting the giant yard unless you are sharing with friends, or really want the tower cup as souvenir. The slushie melts so fast in the heat, it turns to sweet syrupy liquid by the time you get through half of it. Chef Scott Conant’s restaurant inside the Cosmopolitan. We had a phenomenal meal there. The ambiance is modern and sophisticated. Wonderful and professional staff, plus a view of the Bellagio fountain. The “San Remo”. If you like bourbon cocktails like moi, get this drink! 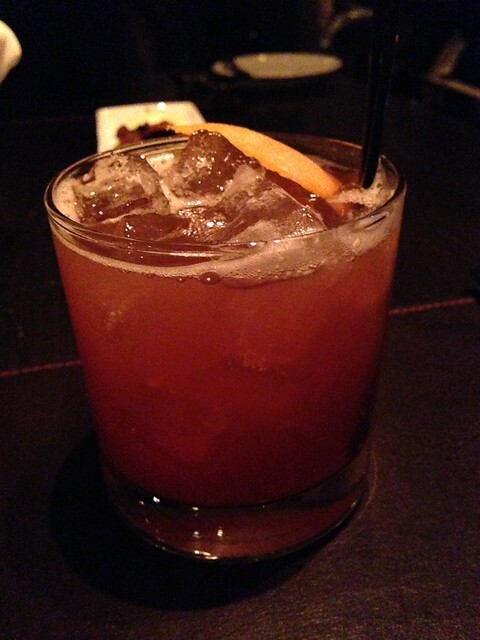 Sweet vermouth, campari, bourbon, elderflower liqueur, and orange. So good! The yellowtail crudo was also slow hand clap worthy. 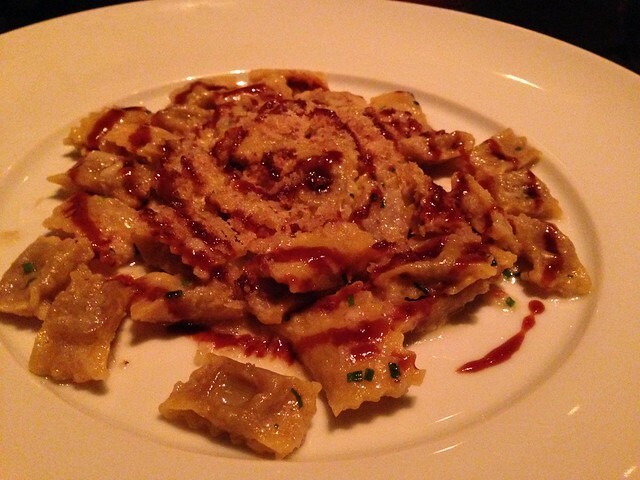 Short rib agnolotti. loved the hint of horseradish and the crunchy toasted bread crumbs. 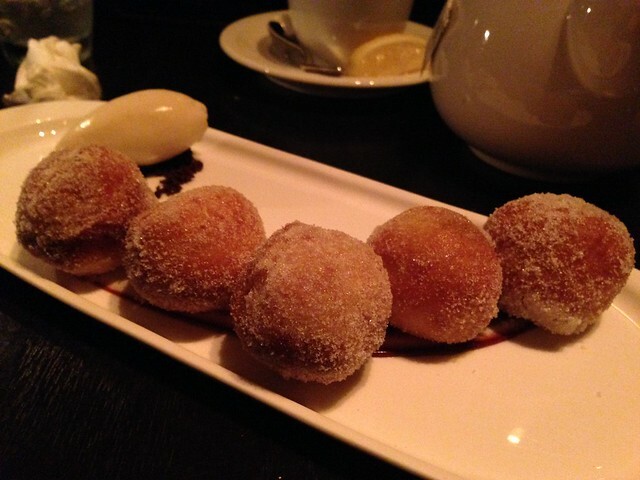 bomboloni stuffed with nutella ganache. That’s banana gelato on the side. This dish can do no wrong. The Wicked Spoon, the Cosmopolitan. The buffet at the Cosmo. I personally liked it better than the Bacchanal buffet. 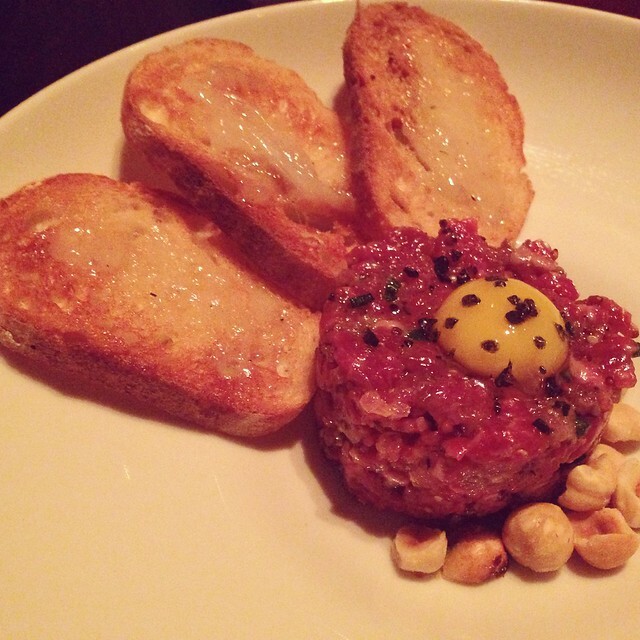 (Though if you like seafood, go to Bacchanal.) The Wicked Spoon has a spectacular selection with all types of cuisine. I didn’t take many pictures here but what a glorious spread it was! I particularly loved the bone marrow, the meats selections, fried chicken (sits in individual metal basket), eggs benedict (we went for brunch, like many other items, they were individually plated. 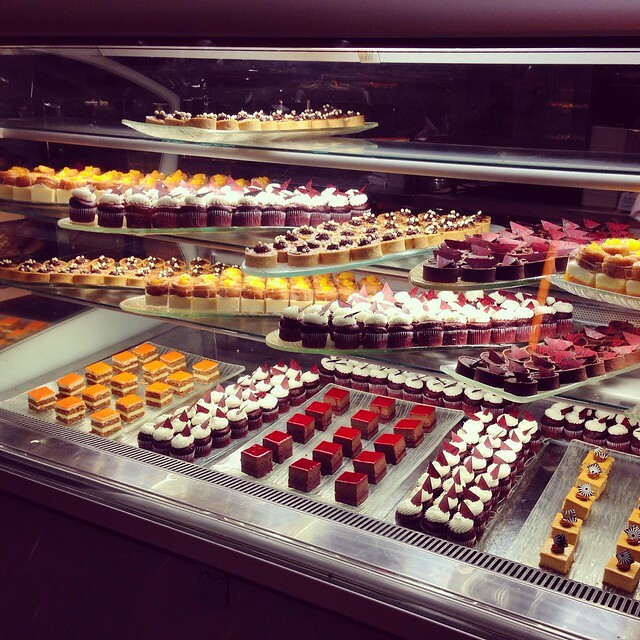 ), and the fresh juices and ALL THE SWEETS! 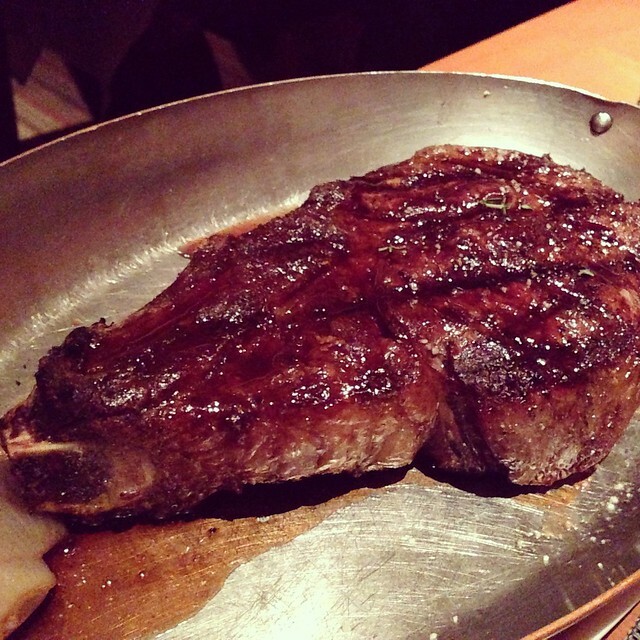 Joe and I love to get the porterhouse cut at steakhouses and share. This piece of steak was so perfect I could cry! Tom Colicchio does not disappoint. Great services here, would love to come back. At Caesars Palace. 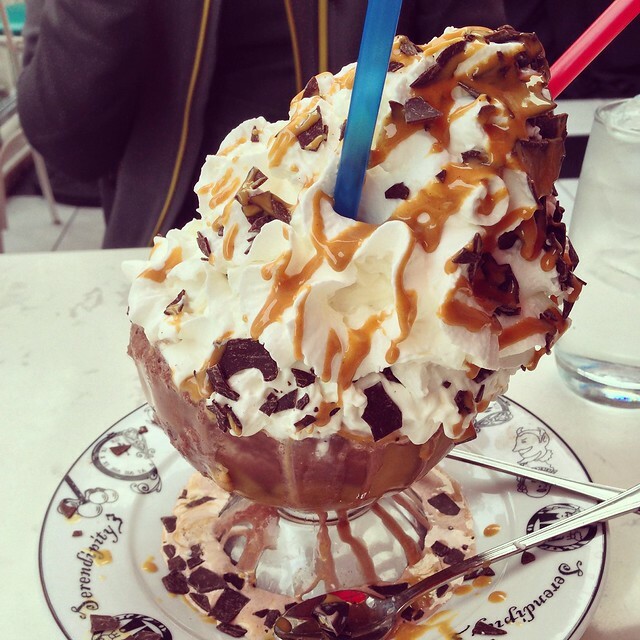 The home of the famous frozen hot chocolate, originally from NYC. I LOVE the peanut butter frozen hot chocolate, see picture below. The portions here are HUGE so you can probably get by with one entree, one appetizer or salad, and one frozen hot chocolate between two people. The leaning tower of frozen hot chocolate. Rent a daybed, order some drinks and food, and just lay back and relax. 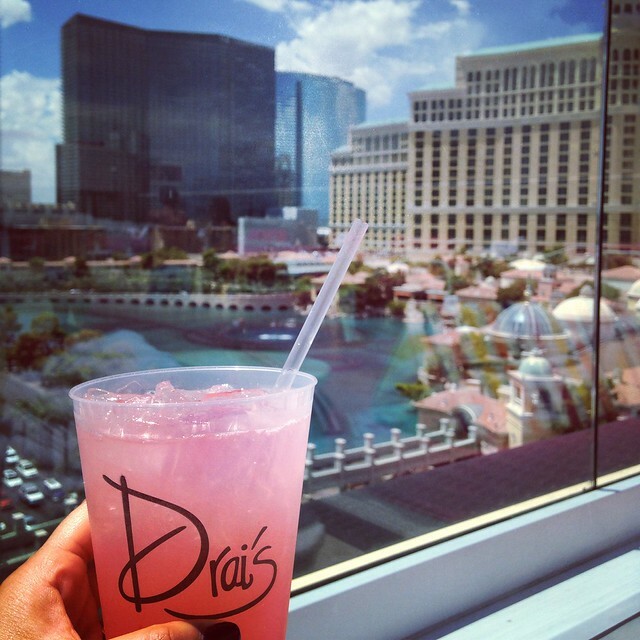 Check out the view of the strip! By the way, the food was quite good, $$$ though. at New York New York Hotel. 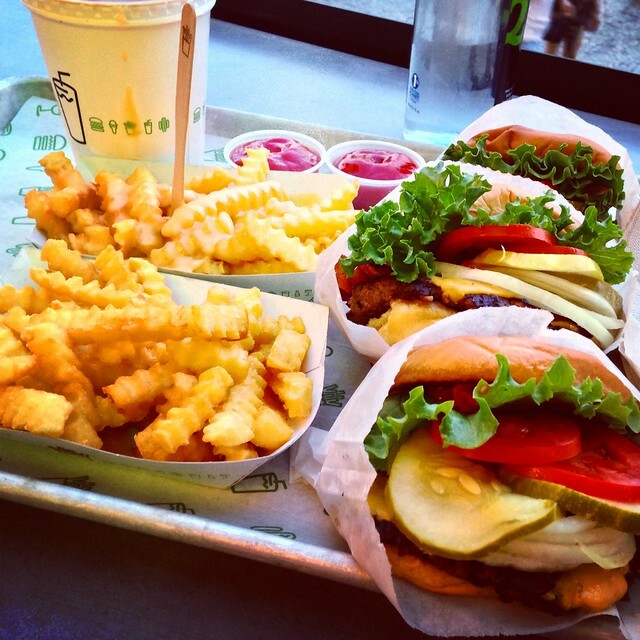 My must-eat in NYC, now in Vegas! The Smoke Stack burger (cheeseburger + smokey bacon + shack sauce), cheese fries, and a chocolate shake. Yes, there are tons of celebrity burger joints in Vegas, but this is pretty close to perfection – Excellent burgers with very fresh ingredients, perfect crispy fries, thick and flavorful shakes. 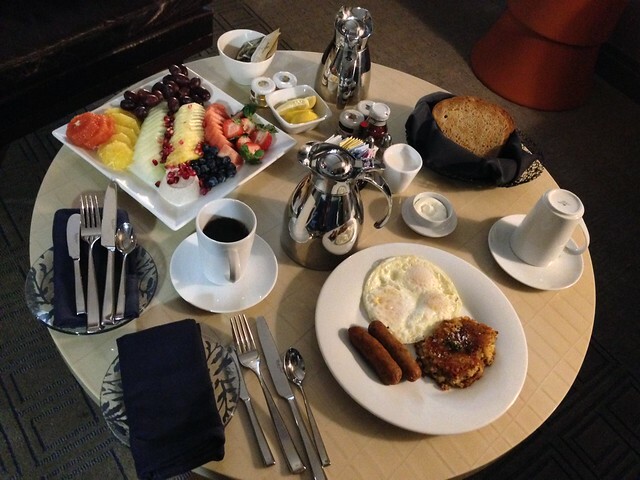 And of course, for the morning (or afternoon) that you just really need to sleep in and recover from previous night’s damage, Cosmo’s room service is not bad, not bad at all! Night view of the Bellagio fountain, from our hotel room terrace/balcony. If you want to venture out of the strip, check out the Neon Museum and the Mob Museum. Both close to Fremont Street. And eat at Pizza Rock, best pizza you’ll get in Vegas! Bye Vegas, until next time!